"That's my goal is to make sure everyone votes. That's always been my goal. This is what I do every election." Perman Hardy has made it her mission over the last 25 years to get every single person in Lowndes County, AL to vote. In the 2017 special elcetion for Senate, Perman was driving all day. 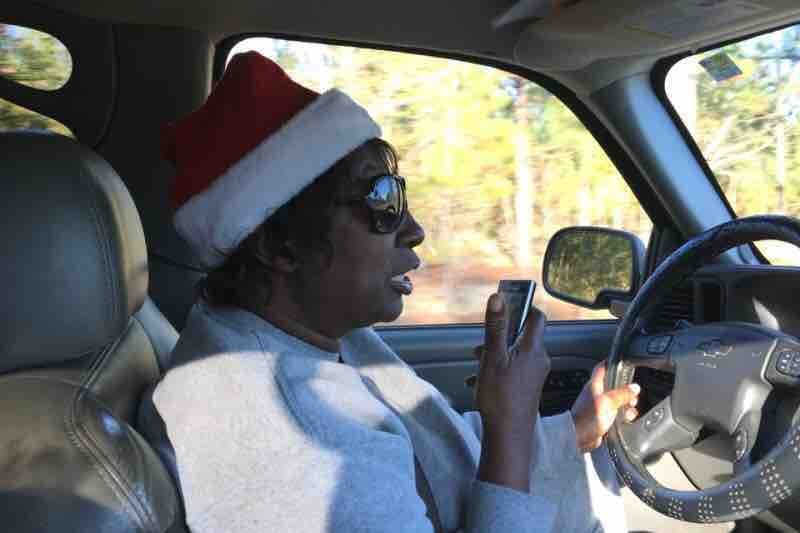 She estimates she drove 50 people to the polls in the predominantly African-American county, helping push Doug Jones to a dramatic victory. After every election day, she maintains this momentum by helping college student register for absentee ballots and continuing outreach to the community by calling people individually. That's where you come in. Perman has been conducting all of this outreach with her own time and money. She's been using a dated cell phone to make countless calls to potential voters. When we asked what she needed most to help her mission, she said, unequivocally, a new phone. We think she's overdue for a new iPhone 8 Plus ($799), as well as a cellular iPad ($449) so she can work on the go. When does she need it? Perman helped give us the gift of a compassionate, decent Senator for Christmas, so we'd like to return the favor. We're hoping to raise funds by December 20th to make sure she can unwrap her new phone for Christmas. Jack and Tina are two strangers who met on the internet after discovering this incredible story profiling Perman. We're in contact with her via the author of the AL.com article, Connor Sheets. We're committed to making sure that every single penny raised through this GoFundMe gets to Perman in support of her inspiring activism. So many people have fought so hard to make sure that every person in this democracy has the opportunity to be heard at the ballot box. Still, voting can be hard work. For many of the people in Perman's community, it can mean taking time off of a work shift or arranging a ride from a friend or neighbor who can drive. By supporting Perman, you're supporting a grassroots champion who is committed to breaking down these barriers. She crushed it in 2017 with a brick phone and an old SUV - just imagine what she can do when she has better tools. 20 days in and you have donated almost $12,000 to Ms. Perman Hardy. Tina and I are so grateful for your generosity and kind words through this process. It's been a while since the last update, so I wanted to let you know what we've been up to. Due to the unexpectedly high volume of donations, we don't want to take any chances with the money transfer. We're planning to have someone onsite to help Perman get everything set up and make sure she gets the money directly, without it having to go through a middleman. The logistics of that trip have delayed us a bit. We're targeting early January, so keep an eye out for another update soon! Wow. Over $1500 raised for Ms. Perman Hardy just this morning! Your generous support is an overwhelming endorsement of Perman and the democratic ideals she stands for. Can we make it to $5000? Support Perman's goal of getting every single eligible voter in Lowndes County to the polls in 2018 by sharing this on Facebook and Twitter. What an incredible response! Tina and I are floored by your generous support of Perman. In just over 3 hours, you've donated nearly $2000. That's enough to buy her the up-to-date devices she needs to keep supporting her community, but let's not stop there! Perman is still paying for her gas and cell service expenses. If we make it to $3000, we'll have taken a huge dent out of those. Share on Facebook and Twitter to keep the momentum going!